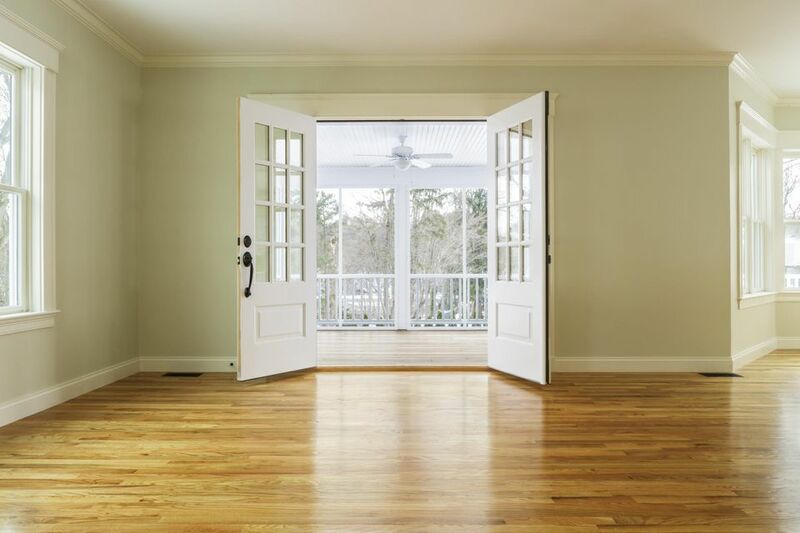 At first glance, bamboo and hardwood flooring materials may appear to be basically the same thing. And they are, in fact, often grouped together as "solid-wood" flooring. They do have a similar look and feel, and they both come in 3/4-inch-thick solid planks and in engineered versions. But amid these similarities are some key differences that set these two flooring choices apart. Despite being commonly grouped with hardwood flooring, bamboo is not actually a wood; it's a woody grass. It grows much faster than hardwood and has a different cellular structure. Bamboo grows in tropical areas with heavy rainfall and even in swamps. You might think this makes bamboo flooring impervious to water, but that's not the case. Unsealed bamboo can be discolored and damaged by water just like hardwood. Hardwood flooring is indeed wood, but not all of it is hard, relatively speaking. True hardwood comes from trees that grow from angiosperm seeds. These include popular species like oak, maple, cherry, hickory, and walnut, among many others. Some hardwood flooring is made with softwood species, such as pine and Douglas fir. Softwood trees grow from gymnosperm seeds. Wood is commonly rated for hardness by a test known as the Janka Hardness test. This involves pressing a steel ball into the wood and measuring how deeply the ball dents the wood. The same test can be used on bamboo even though it's not really wood. In its natural untreated state, bamboo is relatively hard compared to most wood flooring choices. However, darker bamboo tends to be less durable. That is because the darkness is attained through a process known as carbonization. This is achieved by placing the bamboo under extreme heat and pressure, which causes the color to change but also somewhat weakens the material. In general, carbonized bamboo has a Janka hardness rating of 1,000 to 1,100, whereas bamboo in its natural state scores about 1,300 to 1,400. This will be affected to some extent by the process used to make the material, and the amount of carbonization applied to it. Darker bamboo is almost always softer. The hardness of real wood flooring varies widely. On the low end, pine and fir have Janka hardness ratings of 600 to 900, while on the upper end Red Walnut and Brazilian teak can get as high as 2,500 to 3,500. Among the more common hardwood species, red oak is 1,220, hard maple is 1,450, and cherry is 950 on the Janka scale. With hardwood, you have many species to choose from, and each has has its own unique look, feel, and grain patterns. This is compounded by the fact that different cuts also produce different levels of grain consistency. Finally, you also have varying grades, which will lead to either congruous or disparate pieces in a lot. Because of this, hardwood actually gives you a lot more freedom to choose exactly the look that you want. You can pick through a variety of species and options and find something that will perfectly match the style of your environment. The most distinctive appearance characteristic of bamboo lies it its construction, which may be one three types. Vertical-grain bamboo is created with narrow strips of bamboo glued together on-edge, giving it a striped appearance. Flat-grain bamboo is made with thin, flat layers of bamboo glued together, similar to plywood. Stranded bamboo is made up of bamboo fibers bound with resin; this has a highly variegated look of shredded material. Hardwood flooring costs roughly $3 to $5 per square foot for standard materials. More exotic hardwoods can cost upwards of $10 per square foot. Bamboo flooring is priced at about $2 to $5 per square foot. You can sometimes find it for less, but with cheaper material you run the risk of having a low-quality floor. Bamboo has gotten a lot of attention for being an incredibly green, eco-friendly building material. This is because bamboo grass stalks can grow very rapidly; some types attain full height in just 3 to 5 years. Further, when it is harvested the roots do not need to be cut, so it can continue growing without the need for replanting. Bamboo is also all natural, can be recycled, and is biodegradable. However, there are also environmental drawbacks to bamboo. It is generally grown in Southeast Asia and therefore requires a significant energy expenditure to get it to certain locations. It is also harder to manufacture bamboo into flooring than it is to prepare wood logs for use, which means more CO2 expenditures and environmental impact. Compared to bamboo, a hardwood tree can take upwards of 20 years to reach full maturity and be ready to harvest. This means that the materials used take far longer to regenerate. However, the fact that trees take much longer to grow is offset by the fact that they make much more material available when ready to be harvested. At the same time, they only have to be cut down once every 20 years, so there is less energy devoted to harvesting. Trees are also able to grow in a much wider variety of regions, allowing the wood to be more readily sourced from local mills. Both bamboo and hardwood flooring can be ruined by moisture, as in standing water and water vapor. Bamboo is commonly touted as being slightly more moisture-resistant and even mold-resistant, but the differences are negligible and essentially meaningless. If you fail to properly finish either type of flooring, it will discolor with both moisture and sunlight exposure, and it will be highly vulnerable to stains. In any case, if the environment is damp enough to support mold growth, it will damage your flooring whether it's finished or unfinished, bamboo or hardwood. This is why hardwood and bamboo are not recommended for below-grade applications. Hardwood flooring materials are rated for size, shape, moisture content, evenness, consistency of color, and the prevalence of features found on their surface. Ratings are given by several independent organizations, most notably the National Oak Floor Manufacturers Association. This means that you can rate the relative quality of any wood flooring material that you purchase. Bamboo, for various reasons, is not currently rated (in any official way) to guarantee the quality, source, or consistency of the product. Because of this you never know quite what you are going to get when you purchase these materials. You also can’t be sure if they were sourced in a socially and environmentally friendly way. Therefore, the best approach is to work with a reputable dealer or manufacturer with a proven track record of sustainable practices or sources and high-quality product.